Artist's illustration of NASA's huge Space Launch System rocket on the launch pad. 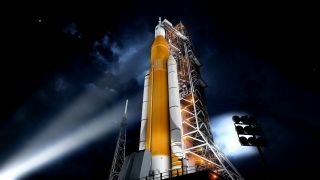 NASA apparently has some news to share about the first test flight of its new Orion spacecraft and its megarocket booster, the Space Launch System. The space agency will hold a press conference this afternoon (May 12) to provide a status update on the planned mission, which is known as Exploration Mission 1. The briefing will be an audio teleconference and begin at 3 p.m. EDT (1900 GMT). You can follow it live on Space.com here, courtesy of NASA, as well as directly from the agency's audio news website here: http://www.nasa.gov/nasalive. Acting NASA Administrator Robert Lightfoot and Bill Gerstenmaier, the agency's Associate Administrator of Human Explorations and Operations Mission Directorate, will participate in the briefing, according to a NASA announcement. No other details on the briefing were provided. The EM-1 mission will be NASA's first combined test flight of the Orion deep-space crew capsule and its Space Launch System rocket, known as SLS for short. The mission will use the SLS to launch the Orion spacecraft on a mission to loop around the moon before returning to Earth. The mission was initially planned to be an uncrewed test flight, but NASA has been studying the feasibility of adding an astronaut crew to the mission at the request of the Trump administration. While NASA was aiming for a November 2018 launch for the mission, SpaceNews reported last week that the space agency was eyeing a possible one-year delay to 2019 after an April 27 Government Accountability Office report found that the agency would be unable to meet the 2018 goal.